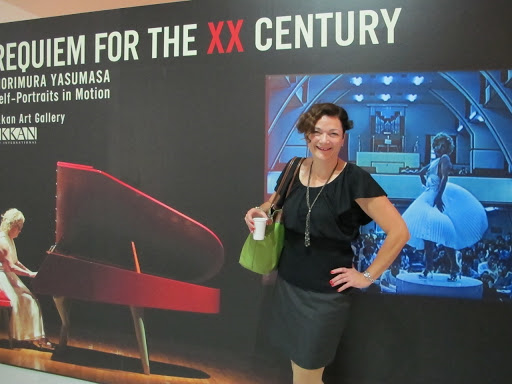 Tuesday night, I went to the last opening night of Ikkan Gallery in Singapore. This gallery opened in May 2011 and has shown a staggering array of modern and contemporary artists. This last show features teamLab , a group of techno-artists that I was introduced to by Ikkan Sanada several years ago. Although it is their last show at Ikkan Gallery, their presence in Singapore will remain as they now have permanent installations at The Arts Science Museum, The National Museum, and Marina Bay Sands. I am going to miss attending the gallery openings which not only introduced me to art in its many and varied forms but also to art lovers. The people who attended the openings were as interesting, to me, as the art that they came to appreciate. I am forever grateful to Ikkan and Miho for inviting me to the openings, and allowing me a peek into a fantastical world. I was bitten by the travel bug at a very early age and for my fourth birthday one of my older sisters gave me a lovely set of matching red and white luggage. As a little kid, I travelled by train and I still enjoy that particular mode of transportation but, let’s face it, train travel is limiting. Air travel made the world more accessible and my first flight was on Air Canada two years after its name had been changed from Trans-Canada Airlines. I had spent the summer of 1967 in Toronto with another of my older sisters and at the end of my vacation she brought me to Toronto International Airport, that’s what Lester B. Pearson International Airport was called back then. I travelled as an unaccompanied minor on the one-hour flight from Toronto to Sudbury. The businessman in the window seat next to me probably took this flight weekly but he kindly pointed out to his overexcited eight year old seat partner how the farm fields looked like a patchwork quilt. Maybe because I was so excited to be flying or maybe because I had drank several glasses of lemonade provided by the flight attendant (they were called stewardesses then), I used the washroom three times on that short flight. In those days, small bars of soap wrapped in white paper bearing the red Air Canada logo were provided and I pocketed one for a souvenir. After my third and final trip to the toilet, I returned to my seat and handing my seat partner a bar of soap said, “I couldn’t help but notice that you hadn’t been to the washroom so I brought you back your souvenir soap”. 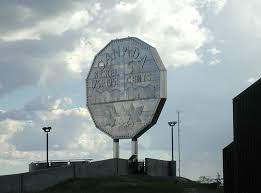 Now Air Canada Express offers 6 flights daily from Toronto to Sudbury with Tango fares starting at $79 CAD. There are a host of attractions to enjoy in Sudbury including Science North with IMAX films and the Digital Dome Planetarium, the Big Nickel and the Dynamic Earth museum, the F. Jean MacLeod Butterfly Gallery, and The Art Gallery of Sudbury contained in the old Bell Mansion. Sudbury has lots of outdoor activities with several golf courses, horseback riding, and many freshwater lakes for swimming, boating and fishing. Lake Ramsey, which we called Ramsey Lake when I was a kid, was listed in the Guinness Book of World Records as the world’s largest lake located entirely within the boundaries of a single city. That changed in 2001, not because Ramsey shrunk but because Sudbury’s boundaries grew to include the larger Lake Wanapitei. You can take the Cortina boat tour of Lake Ramsey starting in May or you can stroll along the Jim Gordon Boardwalk which connects Science North to Bell Park. Bell Park did not have the amphitheatre when I was eight years old but it did have a whitewashed wooden bandstand, a snack bar that served French fries with malt vinegar in paper cones, and a beach where I took my first swimming lessons. Now the park hosts the Northern Lights Festival Boréal, the Sudbury Summerfest, annual dragonboat races and the Bell Park Gazebo Concert Series. Sudbury Downs has offered live harness racing for 38 years with the first race being won by Pink Panther and Jim Wallace on Sunday, June 2nd, 1974. I was a young woman when the racetrack first opened and it was an exciting place to spend time with friends. Races are held on Wednesdays and Saturdays from May to New Year’s Eve and for those who wish to gamble there is Teletheatre wagering available throughout the year and over 350 machines at OLG Slots which is open 24/7. Sudbury, like me and Air Canada, has changed over the years. It is now a vibrant, modern city and, in keeping with all the technological changes of this new millennium, you can get a Sudbury Visitor Guide on-line.. Enjoy!